We’re well into the New Year now so if you think it’s too late to start a fitness regime, you’d be wrong. With so many office space providers incorporating gyms in their buildings or being close to a fitness centre, it’s now easier than ever to get a workout in during the working day, leaving your mornings clear for snoozing and evenings free for socialising*. *watching a boxset in a onesie. Research has shown that exercise can improve the mood of employees in a corporate environment (link to paper here ) so it seems reasonable to provide your staff with easy access to fitness facilities where possible. Whilst not everyone will be jumping on the bandwagon this year, it is certainly easier to encourage your colleagues to get a bit of activity into their daily routine when the options are on their work-doorstep. 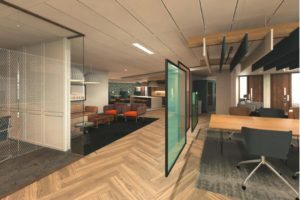 We want to do our bit too, so have detailed some of the most convenient and central offices that have gyms within, nearby or discounts with top brands to get the workforce engaged in something that really helps boost productivity and mental well-being. 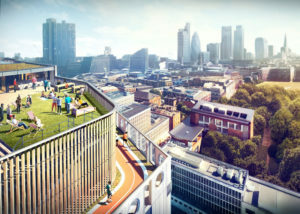 This space boasts its own running track on the rooftop of the building! A real showstopper, this is a beautiful work-space that offers impressive facilities. Based in an old bank, this office is the proud owner of a gym that you have to enter through a vault which is VERY James Bond. The exclusive gym offers free personal training sessions if you really want to crank up the gains. 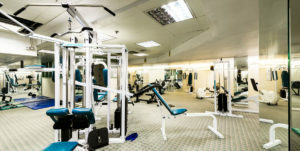 Plenty of space and machines, this gym/office combo is all you need in a great Euston location. True high end spec space with a bike shop as well as a gym, so if cardio and the great outdoors (in central London) is more your thing, your trusty two-wheeled steed will be catered for here too. 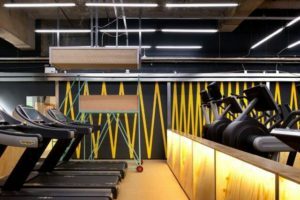 Quirky and collaborative office spaces, its own urban garden and a gym for thrashing out new ideas as well as a workout makes this Shoreditch space a great choice for those looking to achieve high impact results. For more options, use our search facility to the gym filter you can find an office in your area!